Since I started with Daz Studio, I have been very happy with the renders that I get. 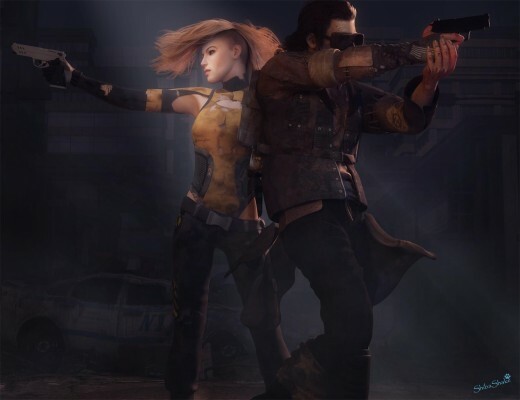 However, I soon started seeing images made with something called Reality and LuxRender in the Daz3d gallery and I was very impressed and intrigued. Naturally, I had many questions. What is this Reality and LuxRender? Is this something that would enhance the images I create? Would I have to do a lot in terms of changing materials and lights to get my Daz Studio scene to render well? Would I still be able to do rapid render iterations to test out different light setups? Would I need to significantly change the way that I do things in Daz Studio to use these tools? Below is an image that I made with a mix of Daz Studio, Reality, and LuxRender. It surpasses what I can do with just the Daz Studio renderer (3Delight). 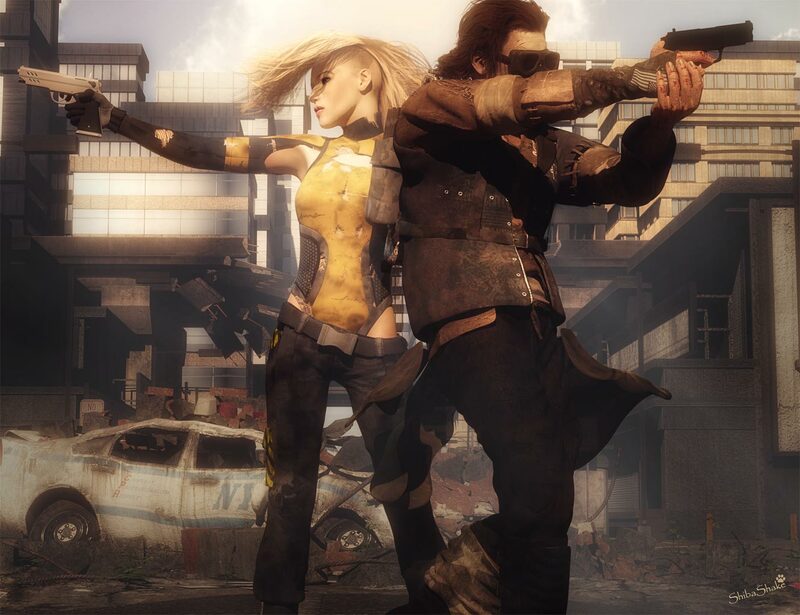 Mix of Daz Studio, Reality, and LuxRender. 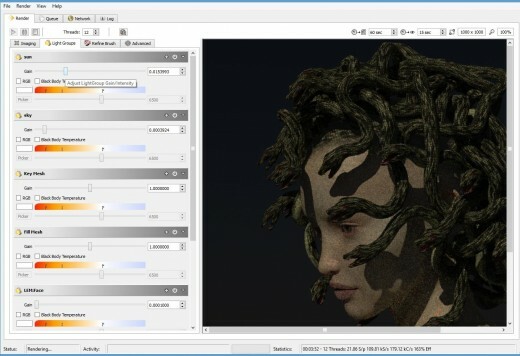 What does this mean compared to the Daz Studio renderer (3Delight)? One of the key things with Lux is that light bounces are captured, so we can light a scene pretty well with fewer lights. In general, I can light a scene in Lux better and more easily than with 3Delight, because some of the lighting effects that I would need to fake in 3Delight are already handled for me by the renderer in Lux. 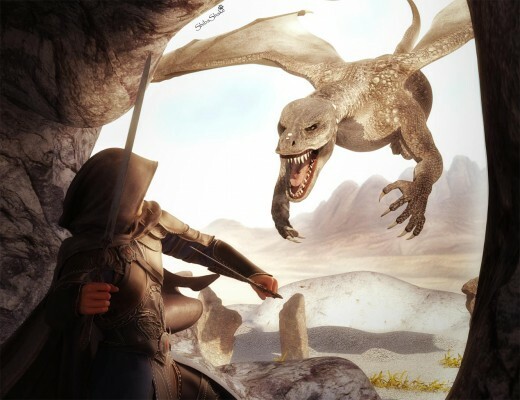 This does not mean that all images rendered in Lux will be superior to those rendered in Daz Studio, or that one cannot render great looking images in Daz Studio. However, it does mean that the Lux images that I render almost always turns out looking better than the ones that I get from just Daz Studio alone. I get the best results by using both Lux and 3Delight. Reality is an awesome plugin that allows me to easily import Daz Studio scenes into LuxRender. There is also a version of the Reality plugin available for Poser. Reality has great support forums in RDNA. The Reality team does a good job in updating their plugin with bug fixes and adding in great new features. There is a version of Reality for Poser. I like the dynamic cloth system in Poser a lot better than in Daz Studio, so I ultimately want to also render in Lux from Poser. I have seen some great looking images that were created with the Reality plugin. Rendered using Reality + Lux, with postwork in Photoshop. Will Reality + LuxRender Enhance the Images I Create? Below is a panel of 4 images showing a very simple scene with just a girl in a t-shirt that I created in Daz Studio. I rendered this scene in both Lux and Daz Studio, and created 4 different images. LuxRender only, with postwork in Photoshop. Combined renders from Lux and Daz Studio. Daz Studio only, with postwork in Photoshop. ** For more detail, click on the image to get a larger version. This is the first render that I made using Lux and even with the limited skill that I had here, I already like the Lux version more than the DS version. Her face looks softer and more realistic, and so does her skin. Below is another quick comparisons. Reality and LuxRender only, no postwork. Daz Studio only, with postwork. Again, her face looks softer and her skin has more detail and better tone. How Much Work Is Required to Create a Good Render in Lux? The key work in creating a good render in Lux is in setting up materials and lights. 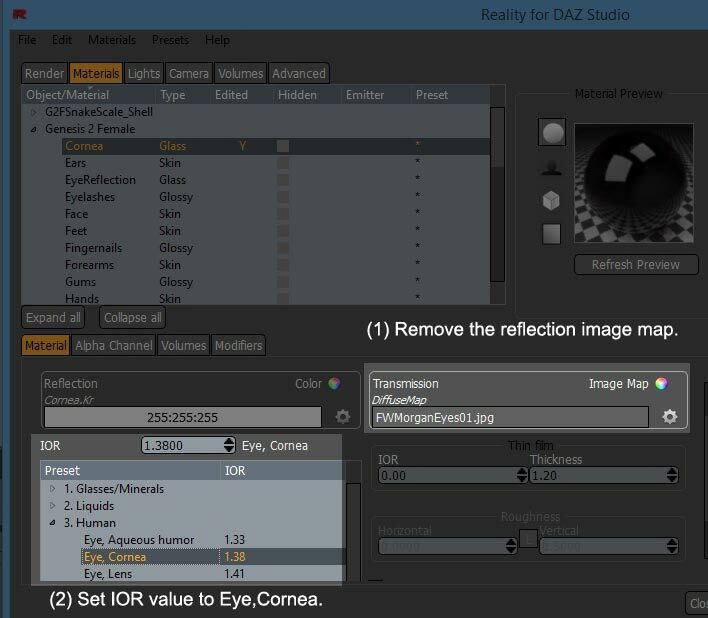 Many of the Daz Studio materials get automatically transferred over to Lux pretty well by the Reality plugin. I haven’t had to do much material editing in the plugin. For example, in the T-Shirt Girl and Victorian Girl examples above, I didn’t do any material editing at all. The material editor in the Reality plugin is easy to use. There are already pre-made material groups, including cloth, metal, glass, water, and more. Most of the time, I only need to change metal and water surfaces. In the Dragon Girl scene below, I changed the material of the two dragons to metal, I also changed the trim of her dress to metal, and I changed the pond at her back to water. I needed to do some test renders to set the visibility of the water to something that looked good in the scene, but that was very doable and the results are well worth it. Reality and LuxRender only, with postwork. Daz Studio render only, with postwork. Again, the face and skin of the girl looks better in the LuxRender image. In addition, the background water also looks more realistic . Unlike in Daz Studio, Lux surfaces have *no* ambient component. Ambient light is used to ‘fake’ global illumination or bounce light. As we know, bounce light is something that is physically modeled in LuxRender, making ambient light and surfaces unnecessary. Daz Studio surfaces with the ambient component turned on, may get converted to a light emitter surface by the Reality plugin. For example, when I render the Daz Dragon 3, his mouth appears as a bright white area. This is because the surfaces in his mouth has an ambient component, so they get turned into light emitter surfaces. 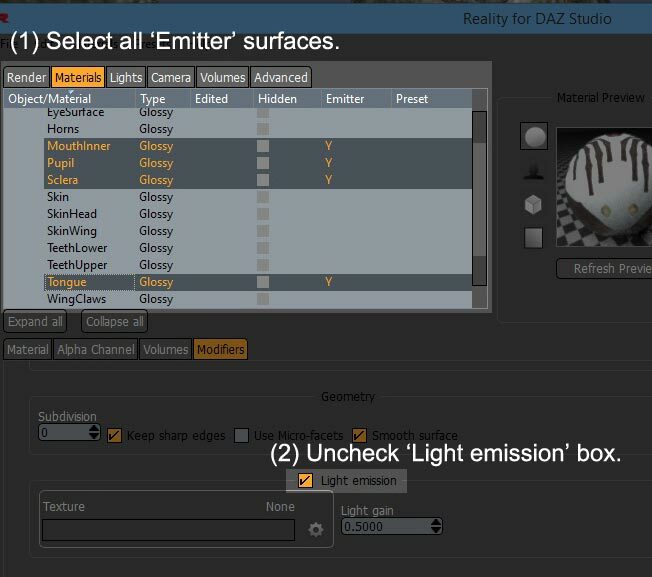 Go into the Materials tab in the Reality plugin, and select the mouth surfaces with Emitter marked as Y.
Click on the Modifiers tab below and uncheck the light emitter box. This will turn off all the light emitter settings for the dragon’s mouth. How to select light emitter surfaces and turn them off in the Materials > Modifiers tabs. In Daz Studio, ambient shader settings are sometimes also used to achieve glowing surfaces. In this case, we want to leave the light emitter option on, but scale it properly so that it does not overpower our other light sources. In this scene, I had to turn off all the light emitter settings for the dragon’s mouth. Some characters render with black eyes in Lux no matter what we set the iris color to. This happens because we sometimes fake eye reflection in Daz Studio by putting in a reflection image map on the cornea or eye reflection surface of the character. Lux has true eye reflection of light sources, so these are no longer needed and get in the way. The very simple fix to this issue is to make sure that all image maps are removed in the cornea and eye reflection surfaces of the character. I click on the wheel icon to edit the texture. Then I set it to Color (instead of image map) and set the color to white. I also set both to glass, and set the IOR value to Human > Eye, Cornea. How to set the human cornea surface to remove the black-eye effect. Rendered in Reality + LuxRender, with postwork in Photoshop. 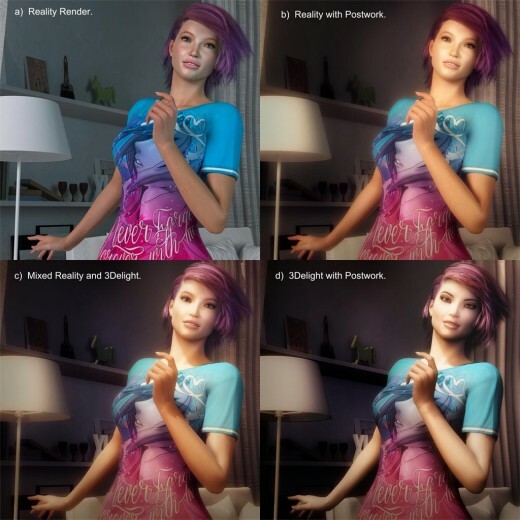 How lights transfer from our Daz Studio scene, will depend a lot on how we light our scenes. There are point light and spot light equivalents in Lux, so those get automatically transferred by the Reality plugin. There are no ambient lights in Lux, so those either get converted to Mesh Lights if we have that setting checked, or they do not transfer at all. I generally turn off all ambient lights from Daz Studio, because we already have bounce light in Lux. Things become a bit more complicated when it comes to distant or infinite lights. I make heavy use of these in Daz Studio, partly to help provide more interesting ambient light, and partly to provide shadows. However, the use of infinite lights are discouraged in Reality + Lux because it does not correspond to any type of real light, except for sunlight. Let me repeat this: never. Those lights are harsh, unrealistic and can create fireflies and high noise. One Infinite/Distant light is one too much. Two of those are a disaster and three are the render apocalypse. Combine those lights with others and you have a real mess that will never clear to a satisfactory results. Infinite/Distant lights are an invention of 3D biased renderers that don’t have any connection with real life. Think about it. With the exception of the Sun, where can you find an Infinite or Distant light in nature? The key to realism if to replicate lighting conditions that are based in real life, not to apply biased tricks to an unbiased renderer. In Reality + Lux, I mostly use Mesh Lights to light my figures and indoor scenes. I use the Reality Sun light, together with Mesh lights for outdoor scenes. I am currently learning how to make proper use of Image Based Lights (IBL), so I hope to integrate more of those in the future. Night Scene – Lighted mostly with Mesh lights. Day Scene – Mostly lighted with the Reality Sun-light. One very useful feature in Reality + LuxRender is the Light Groups feature. I usually set each of my lights in a separate light group in the Reality plugin. Then, when I bring up LuxRender, I can go to the Light Groups tab, and control the strength and color properties of each of my lights in real-time. Controlling each of my lights separately in LuxRender by using the Light Groups tab. My workflow did not change much after integrating Reality and LuxRender. I continued to create scenes the way I usually do in Daz Studio. However, I now pay less attention to the light and material settings within Daz Studio, and spend most of my time in setting these within the Reality plugin. Once my scene is ready, I do a bunch of quick test renders within Lux, while tweaking lights and materials to get them looking right. Happily, rapid prototyping is still possible because usually, after one or two minutes I have a good enough scene to judge lights and materials. When I get something that I am happy with, I leave it to render overnight and when I wake up in the morning, it is ready! I am definitely very happy with the Reality plugin and LuxRender. I did not have to change my workflow much. I have to put in a little bit more work in terms of materials. Effort in lighting the scene is about the same, except now I focus on using Reality lights. I still can do rapid prototyping to test out materials and lights. There is a very noticeable improvement in the images that I render. You Rock!!! I’ve been trying for days to fix the eyes in Gen 8 (mine were white like serious caaracts). Your solution works great. My Gen 3 renders came out fine so I was considering how to move the Gen 3 eyes to Gen 8. This solution is not a “work around” it addresses the problem, not the symptom. Thank you!!! Are these exclusive to use with 3Delight, or does it work also with Iray? As I understand it, Iray is a ray tracer, like Lux. So now, I mostly use Iray because it is natively supported by Daz and most importantly by the vendors at Daz. Sometimes, I may combine it with 3Delight layers. Thanks for the info. I just started using Daz about 1 month ago and I have no experience with other 3d programs (nor 2d for that matter), so I’m still trying to figure it out how these things work and what can be combined to achieve good results. I’ve been watching tons of tutorials and reading a lot of things online, and I have to say your page has a lot of very interesting and detailed information, plus your artwork is stunning and extremely inspiring! Thanks for sharing your knowledge with us! I’ve had -0- luck so far with Reality and Lux. Everything turns out dark! I guess perhaps it’s RTM time, along with practice. Having used PhotoShop for so many years, I like the immediacy of being able to see what an adjustment in lighting is going to do. 1. Need to use the Reality lights. Daz Studio lights did not work last time I rendered with Reality. 2. Sometimes there are skydomes in older environments, which may block light coming from the Reality IBL.